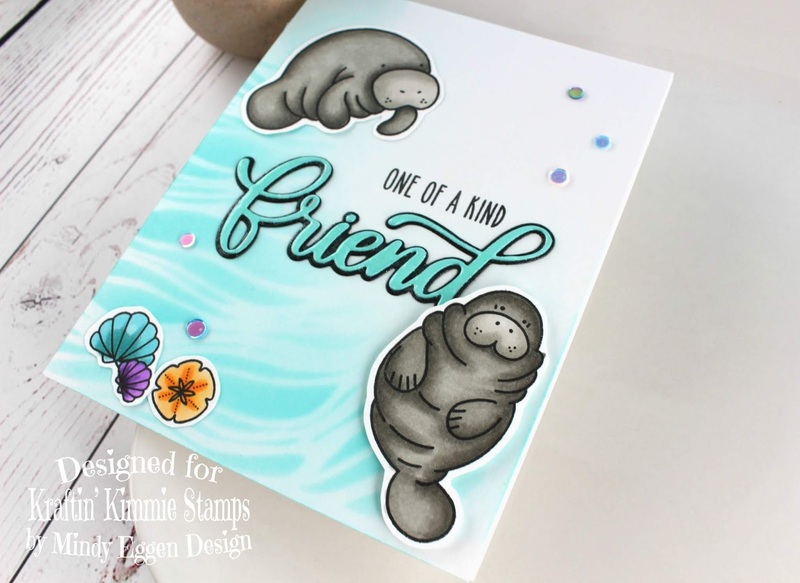 of our JULY Krafty Peeks at Kraftin’ Kimmie Stamps! THIS AFTERNOON at 1pm EST on Facebook! celebrate ALL the new sets? My images are stamped on Neenah Solar white cardstock with Wicked Black ink. Then I fussy cut my cute critters & images out with scissors. For my background, I created some water using the Rice Paddies Stencil with Peacock Feathers Distress Oxide ink. I removed the stencil and lightly went over the area just to soften it up. I adore this color to make water! I then partially stamped the sentiment and added the die cut word friend from the Friend die from Simon Says Stamp. I layered my images to my card around the sentiment in the middle. For a little added interest I added some Groovy Sequins around the card. I also added some Nuvo Shimmer and Tonic Glaze to my Friend die cut. Now don’t forget!!! It’s also CHALLENGE DAY and as always, during release week the theme is ANYTHING GOES!!! 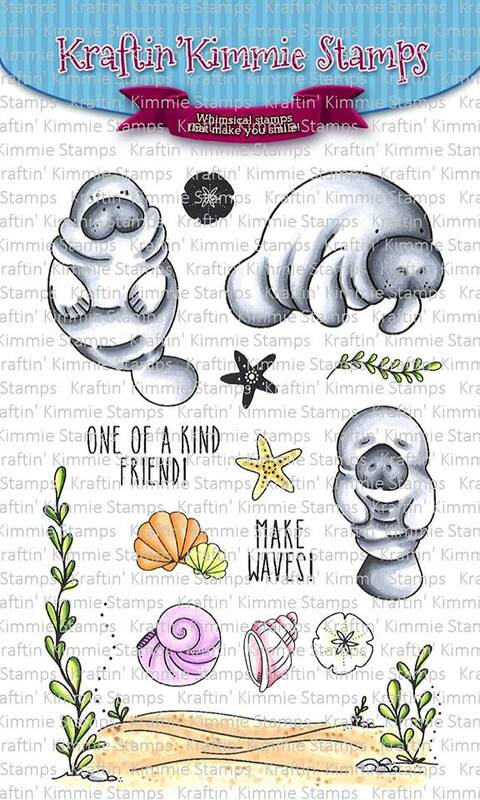 So create a card, scrapbook page or altered item with a Kraftin’ Kimmie stamp!! Use any sketch, any design, any embellishments because Anything Goes! 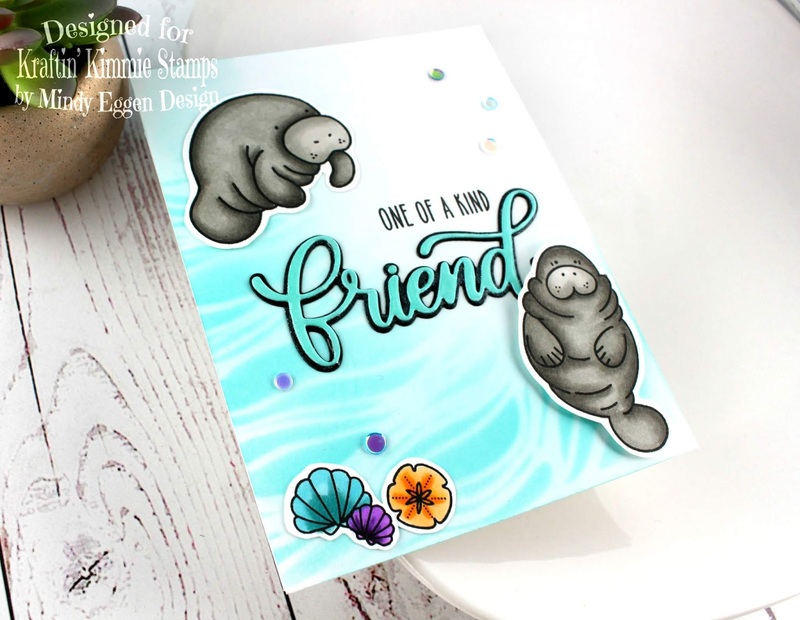 Have some krafty fun and join us this week because we’d LOVE to see your KKS designs. You have a week to play with this challenge (until July 27th) and at the end of the month, we’ll announce a WINNER from all of the weekly challenges for July! We hope you can play along for your chance to WIN a $40 Gift Certificate to use on ANYTHING you want in the shop!! Wanna win?? I love how you colored the shells! And the background only on half of the card makes it so elegant! I love this card and stsmp set. There are so many wonderful things about this card! 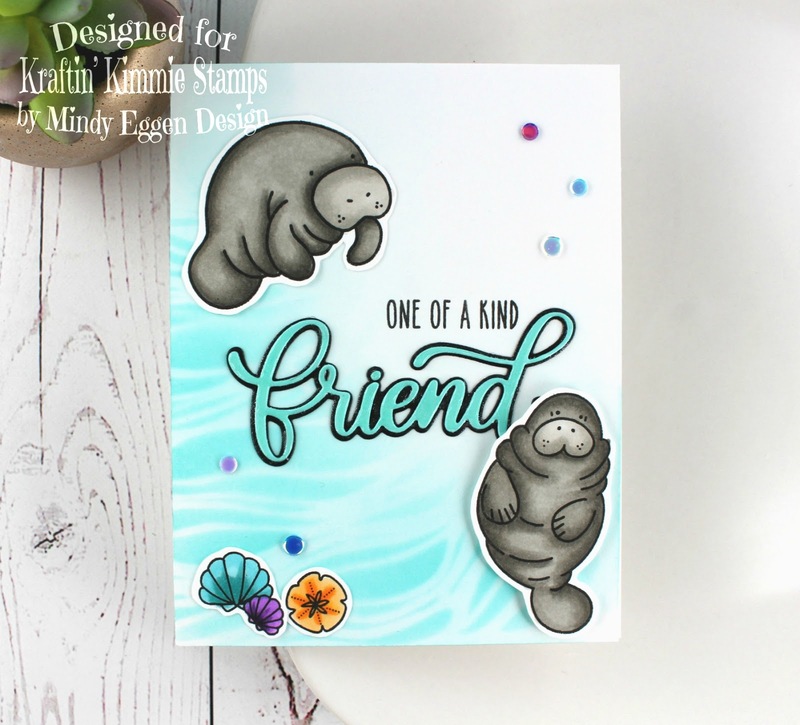 At first glance you just go oh so nice and then you start looking closer and go oh love that water colour, how love how the waves are made, oh look at the glimmer there, oh love the Friends word diecut, oh look how great her fussy cutting is…shall I go on??? hee hee! Well done! Especially the water. Fabulous card! Love how the water flows in the background and the coloring is excellent. to a section of the card.